LAKEFRONT, La. 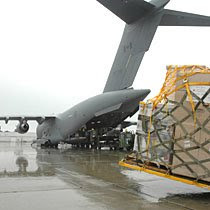 - A large Canadian Forces aircraft helped evacuate "medically vulnerable" New Orleans residents Sunday evening as Hurricane Gustav charged across the Gulf of Mexico. A large C-17 plane, carrying a team of 12 medical personnel, arrived in Lakefront, La., around 5:30 p.m. ET. With the capacity to transport up to 150 people per trip to a safe zone, the plane started loading evacuees almost immediately. Read the rest of The Canadian Press story here.